Good oral health and hygiene is an important part of general health for the whole family. The Community Oral Health service has a strong emphasis on prevention of tooth decay and providing parents with advice to support their children's good oral health, at the time of their child's appointment. The service offers FREE basic dental care, to children who meet the eligibility criteria for publicly funded health and disability services, from birth until they begin high school. Children are enrolled for free dental visits from birth. All babies will be offered their first appointment before they have any teeth in their mouth.This is done to ensure that when the teeth arrive everyone in the family/whanau knows how to help look after them. It is important to look after baby teeth as decay can affect a child’s eating, their speech and development, and may even affect their adult teeth as well. Free basic care is available at all of our locations both the mobile dental clinics and the community dental clinic. 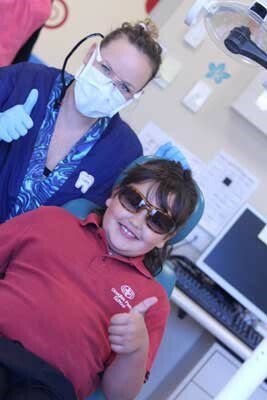 Oral health advice and encouragement for good oral health. Examination and dental X-rays, if necessary. Preventative treatment, such as topical fluoride and fissure sealants (coatings). Children requiring treatment that cannot be provided by the Community Oral Health Service are referred to a private dentist. Orthodontic treatment (straightening of teeth using braces) is not funded or provided by the DHB. The Wairarapa Oral Health service see’s the children in our region either on the Mobile Dental Units visiting their schools or by visits to our Community Dental Clinic. We have a Community Dental Clinic based next to Masterton Intermediate School, Intermediate Street which was opened in December 2012. Two 2-chair mobile units are towed to sites all over the Wairarapa, bringing on-site screening, examination and treatment. Each is staffed by two therapists and an assistant . The units have been designed for the comfort of both children and the staff. TV in waiting room; piped music; children can have stories playing through CD system. All equipment designed with the comfort and safety of children in mind. Each clinic thermostatically designed for the comfort of children and staff. Features latest developments in cross infection control. The dental staff will contact you by phone or send an appointment card in the mail. If the time does not suit please contact the clinic to change the appointment. All adolescents are entitled to free routine dental care till their 18th birthday. At the completion of year 8 all children are transferred from the oral health service to the Private dentist of the family’s choice.A form will be sent home with your child to fill in and let us know where you would like them to attend during adolescence. Once they have reached college age if you have any queries about your adolescent ring your dentist. If you can’t remember where your adolescent is enrolled ring any dentist throughout the Wairarapa to re- enrol or book an appointment for your teenager. If you are having any difficulties please feel free to phone us at the Community Dental Clinic as we are very happy to help you. Every dentist throughout the Wairarapa is enrolled in the free dental scheme so you can choose a dentist that best meets your needs.